The Oratory of the Holy Crucifix built between 1731 to 1733. Early in 1581, Senglea, which up till then formed part of the parish of Vittoriosa, became a new separate parish with Don Antonio di Nicolai as the first parish priest. 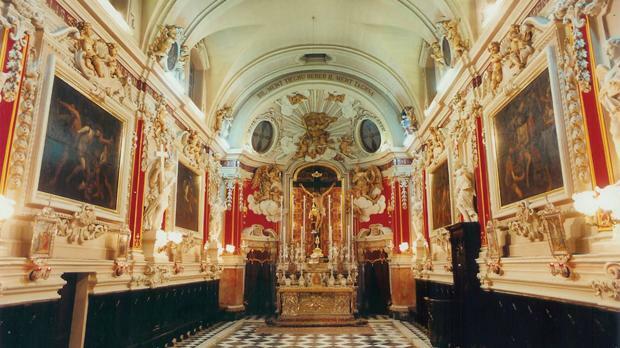 As time went by, this became one of the main parishes of Malta, and on May 21, 1786, Pope Pius VI elevated it to Collegiata Insignis. On January 3, 1921, Pope Benedict XV honoured it with the title of Basilica Minore. One of the main reasons for the bestowal of these privileges was the accomplishment of substantial amount of social and pastoral deeds carried out, among the poor and socially isolated, by members of the various confraternities, which over time were set up in the Senglea parish. 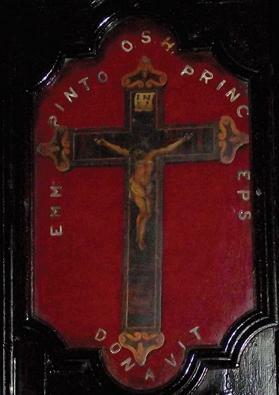 An inlaid wooden crucifix donated by Grand Master Emmanuel Pinto the confraternity. The earliest and most important confraternity was the Confraternità del Santissimo Sagramento, which was founded between 1575 and 1580 in the church of St Julian. In 1598, the Confraternità del Santo Rosario was established at the new church of Our Lady of Porto Salvo. The Confraternità della Carità was set up 400 years ago in 1615. This confraternity was the first to be set up at the parish church. As time went by, the confraternity joined the Confraternità del Santissimo Crocifisso, which is the subject of this feature. 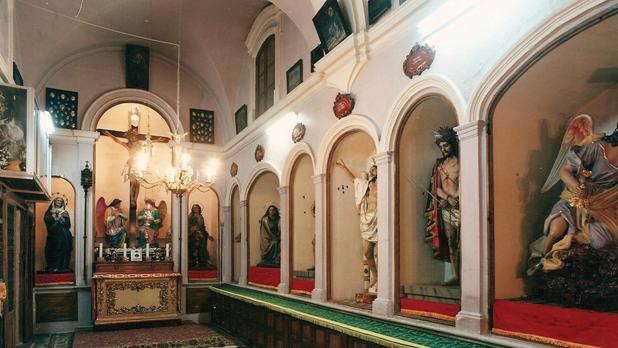 The confraternity dedicated alla nostra signora della carità was set up by Don Vincenzo Caruana, the second parish priest of Senglea. Since its creation, this confraternity was given great importance in the parish. In fact, a chapel was set aside in the parish church to be used by the confratelli of this confraternity. From a report presented by Caruana to Apostolic Visitor Mgr Baldassere Cagliares, it was noted that in 1616, even though the confraternity had been set up for just a year, it had already been affiliated to the Arciconfraternità della Carità based in Rome. The titular feast of the confraternity was Sancta Maria ad Nives (St Mary of the Snows) and it was celebrated on August 5. Confratelli carrying banner, cross and lanterns at the Good Friday procession. The main aim of the confraternity was to collect alms to aid the unfotunate. Furthermore, members met the expenses of the poor’s burial and offered Masses for the repose of their soul. “The members of the confraternity practise their acts of charity by taking care of the burial of the poor for free,” wrote Bishop Michaele Balaguer, in 1653, after a pastoral visit to the Senglea parish. Eventually, the Confraternità della Carità was entrusted with the duty to propagate devotion towards the mysteries of the passion and death of Jesus Christ. Since 1710, the confraternity started to celebrate the feast of the Invention (finding) of the Holy Cross, which falls on May 3, as its titular feast. The confraternity reached its peak when it started to organise the Good Friday procession, the first record of which goes back to 1714. On viewing the parish archives, one gets the feeling that this could have been taking place even some years prior to this date. Moreover, since the feast started in 1710, it is obvious that the procession originated in the beginning of the 18th century, making the Good Friday procession in Senglea one of the oldest held in the Maltese islands. The new Confraternità del S. S. Crocifisso was founded in 1715 – 300 years ago – in the last days of parish priest Michaele Testaferrata. The confraternity took upon itself all the obligations previously assigned to the Confraternità della Carità, which by now was facing extinction. The vestry of the oratory. To ensure the fulfilment of the confraternity’s obligation to donate alms, a procuratore used to be appointed from among the members. His role was to administer the funds so that money could be distributed fairly among needy members of the confraternity, each according to his or her needs, and when available, even to the unfortunate among the Senglea parishioners. Senglea in those days benefited a great deal from projects embarked upon by the Order of St John. However, there were still many on the poverty line, either because of lack of a stable job or because of some other misfortune. The elderly were the worst off, especially those who suffered from some physical disability or lived on their own. Orphans and widows, especially those with large families and without a stable income, also needed assistance. The charitable deeds and the dedication with which the confraternity promoted devotion towards the passion and death of the Lord helped to attract to its fold many of the people of Senglea and others from neighbouring towns and villages. Membership in the confraternity was not only made up of common people, but also of many intellectuals, artists, priests and knights. Suffice it to say that for eight years, between 1763 and 1771, Grand Master Emanuel Pinto was a confratello of the confraternity and even became its prefetto. The first station of the Via Matris. In 1725, the confraternity commissioned pain­ter Carrado Gianquinto (1690-1765) to produce a new titular painting for the confraternity’s altar in the parish church. The large and beautiful painting, which can still be admired, represents Our Lady grieving over the dead body of Christ just taken down from the cross. In 1773, the confraternity was accepted as a fellow member of the Arciconfraternità del S. S. Crocifisso of the church of San Marcello al Corso in Rome. This amalgamation enabled local confratelli to partake in the indulgences granted to the confratelli of Rome’s archconfraternity. The members of the confraternity used to partcipate in the processions organised by the confraternity itself and in those carried out by the parish, such as that of the titular feast of the Nativity of Our Lady, on September 8, and that held on the feast of Corpus Christi. During these processions, the members used to wear their religious garb and a hood which covered their head, both made from dark linen, a black cape, a cord round their waist and a pair of sandals. 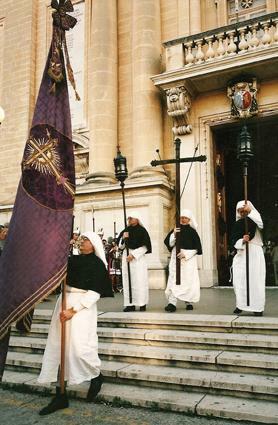 During these processions, the members followed a purple standard which had an embroidered cross as an emblem in its central part. The cross of the confraternity and two lanterns followed. The confratelli walked along one after the other in two files. In their hands they used to carry a walnut cross and a long dark candle. The prefetto, accompanied by his assistants, one on each side, used to bring up the rear of the procession. 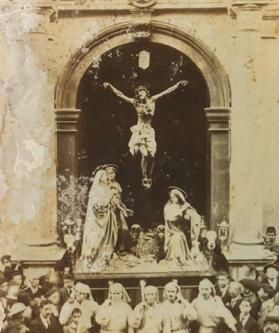 The statue of the crucifixion being carried out of the basilica in 1918. The number of the confratelli grew in number and the enthusiasm for their cause knew no bounds. Very soon, the chapel they had in the parish church became too small to accommodate them all. The fact that it was becoming very difficult for them to carry out the spiritual devotions prescribed by their statute, especially during the period of Lent, led them to decide to build a new and large oratory. Building works on the oratory began in 1727. The land on which it was constructed was donated to the confraternity by the bailiff of the Order of the Knights, and later, by Grand Master Emanuel Pinto. Senglea-born artists contributed to the design of the spacious and stately oratory. Claudio Duranti was the architect, Francesco Zerafa was the master mason and the sculptor was Pietro Paolo Zahra. The latter embellished the oratory with fantastic sculpture in the baroque style. The construction of the oratory took from 1731 to 1733 to be completed, and to this day, it remains a masterpiece and a may be considered a cenotaph for these three artists. The statue of Jesus the Redeemer in its niche. Details that attract immediate attention are the walls, which are adorned with equidistant pilasters, and the elevation of the main apse. Six angels, each carrying instruments of the Passion, are placed between the pilasters. These angels were modelled on those found in Rome, on Ponte Sant’Angelo, which were originally sculpted by Gian Lorenzo Bernini (1598-1680). A huge, imposing wooden effigy of the crucifix, which was brought from Rome, is placed in a niche on top of the main altar. The interior of the niche is decorated with a large number of relics of saints. 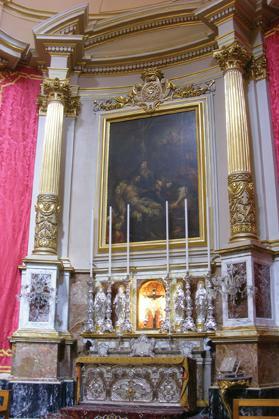 Kept with devotion under the mensa of the oratory’s main altar are the remains of the martyr S. Vittorio. These remains were brought over from Rome in 1788. In between the main pilasters on the sides of the oratory there are six valuable paintings. Two of them, one representing Jesus Christ with the cross and the other depicting Our Lady of Sorrows, are attributed to the renowned painter Mattia Preti (1613-1699). The other four paintings, which show episodes from the Passion of Our Lord, were painted in 1739, and are the work of the Senglea-born artist Francesco Zahra (1710-1773). 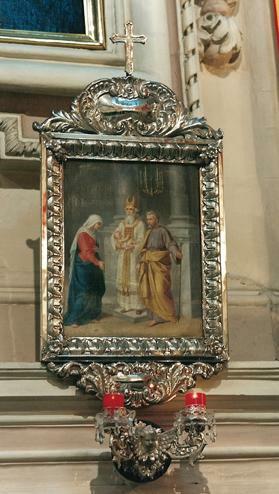 A set smaller paintings, representing the seven stations of the Via Matris, were made in 1890 by artist Giuseppe Bonnici (1835-1900), another native of Senglea. However, the outstanding attraction in the oratory is the miraculous effigy of Jesus Christ falling under the weight of the cross on his way to Calvary, populary known as ‘The Redeemer’. The origins of the statue are unknown. There exist no records of when it was made and who was its author. As said earlier, the Good Friday procession in Senglea started before 1714. 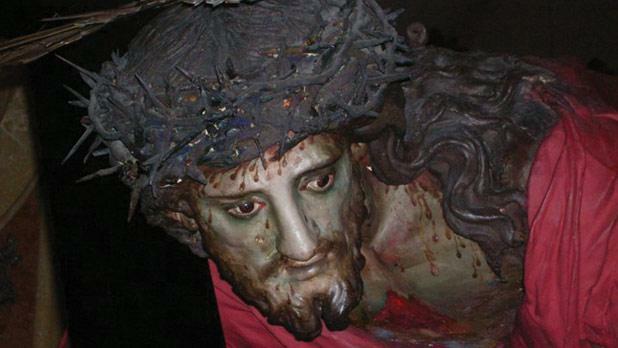 Since it is believed the statue was used in those early Good Friday processions, one can determine that it is the oldest among the Senglea Good Friday statues, and hence venerated there for over three centuries. Undoubtedly, since its early arrival in Senglea, this statue has exerted great charisma and devotion. This is proven by the fact that when the confraternity decided to build the oratory in 1727, the confratelli agreed to allocate an adequate niche for this revered statue. This niche made it possible for the people to venerate the statue of the Redeemer throughout the year. The miraculous effigy of Jesus the Redeemer. This ardent cult and profound veneration were reason enough to warrant a decree, issued by Pope Benedict XIV in 1751, to grant the privilege of having a permanent altar erected in front of the niche of the statue of the Redeemer, for the celebration of Holy Mass. 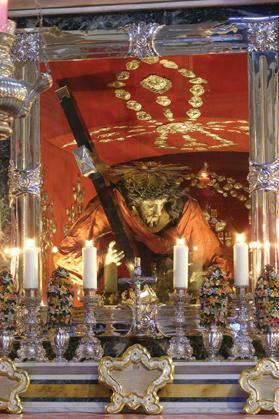 To this day, thousands of pious devotees visit the Senglea basilica, particularly during Lent and Holy Week, to pray fervently in front of this compelling statue. Moreover, thousands throng the streets of the city of Senglea every time this miraculous statue is carried around in procession or pilgrimage. The other Good Friday processional statues can be seen stored in niches that were constructed in a vestry, built in 1742, an annex to the oratory. There is also a staircase which leads to the large vault which in the past used to serve as a burial place for the confratelli. Every first Monday of the month, in the pre-war years, Mass used to be celebrated in the vault for the repose of the soul of the confratelli. Beyond doubt, as time went by, the oratory of the Holy Crucifix became a sanctuary of devotion towards the crucifix and Jesus. The vast quantity of objects and ex-voto paintings which one can see in the oratory and in the vestry are a strong indication of how much Jesus Christ is truly the saviour of all mankind. In most ex-voto pictures, one can see at the top corner either a drawing of Jesus the Redeemer or of the crucifix. This explains why the giver is giving thanks for what God did for him or her during tough times, showing that miracles do happen. The oldest of these paintings, which shows the year 1745, is painted in oil on canvas. The others are painted on wood and some are painted with water colours on hard paper. Most of the pictures are of unknown artists and on a small number of them there are the initials ‘VG’ written in red. Most probably these were painted by Vincenzo Gonzi, who in the first part of the 19th century was a renowned artist of ships and galleys. Various silver ex-voto offerings, mainly representing parts of the human body such as an eye or an ear, have now been used to decorate the frieze of the oratory. These gifts are a simple way of visibly paying homage and a sign of gratitude and thanksgiving to God. It was through divine providence and sheer good luck that the oratory escaped virtually unscathed from the ravages wrought by World War II. This in spite of all the damage incurred by the city of Senglea, including the near total destruction of the basilica. The confraternity’s altar, dedicated to Our Lady of Sorrows. The appearance of the oratory, already an artistic and monumental effigy in its own right, is greatly enhanced during the feast of the Nativity of Our Lady. During this time of year, artistic and valuable objects can be admired since they are exhibited in the oratory. Apart from the mentioned paintings, one can admire a set of six large wooden candlesticks, made in the bottega of Mariano Gerada and several silver objects. The most important of these are two antependia. One was manufactured in 1864 by the Busuttil silversmiths on a design provided by Senglea-born artist Vincenzo Bonnici and the other made in 1953 by the Fonderia Artistica Battaglia of Milan, on the model produced by Antonio Sciortino in 1937. All this shows that since its first years as a parish, Senglea propagated great devotion towards the passion and death of Christ, and this thanks to the hard work of the Confraternità della Carità and later on of the Confraternità del S. S. Crocifisso. This piety finds its focal point in the miraculous image of Jesus the Redeemer. This devotion unfolds to all parts of the Maltese islands and even to foreign lands where people from Senglea and from other locations in Malta migrated to. This zeal makes of Senglea’s church a living, breathing national sanctuary.